Say, What A Day!!! : OCEANS, Inc.
What a day! … today is fast ebbing away. As I begin writing, it is past 9 pm. In the Atlanta, Georgia area, today was a “normal” day—with a little rain, some clouds, some peeking sunshine, and just the usual working, schooling, jiving, and living. By all counts, a regular day. So, what’s in a day? and what’s in a day’s past? Are days connected the way humans are connected—to parents, grandparents, great grandparents and beyond? Today, February 8, 2017 is a day rife with a poignant history that few know about. 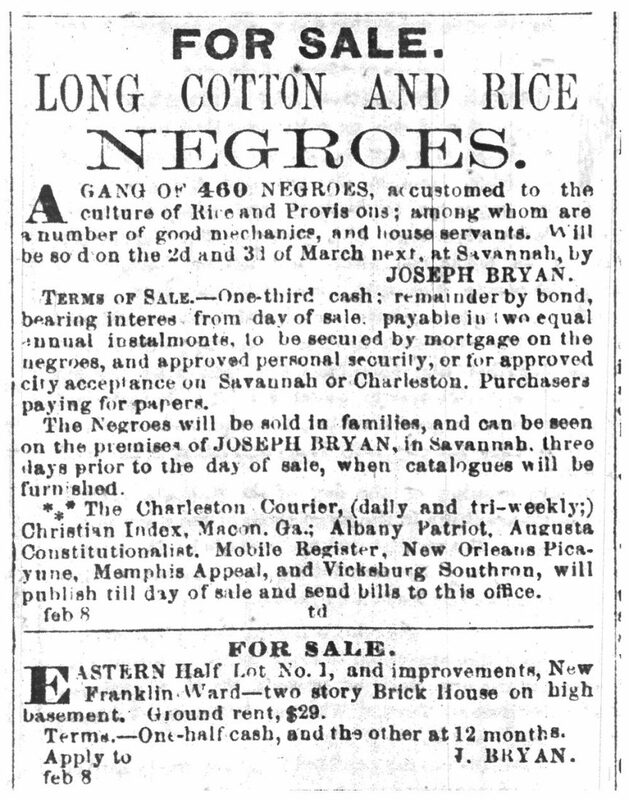 Today’s ancestor, February 8, 1859 heralded doom for 460 African American men, women, boys and girls who were advertised for sale in antebellum Savannah, Georgia. They were about half of all the enslaved Africans and African Americans who had toiled in the coastal Georgia rice and cotton plantations belonging to the Butler family of Charleston, SC and Philadelphia, PA. As the accompanying advertisement from the Savannah Republican Newspaper from 158 years ago, shows, February 8, 1859 was a sad day, indeed. The day was pregnant with imminent horror for 429 men, women and children who were ultimately sold on March 2nd and 3rd, 1859. For seven people, also advertised, but not sold, it was a close call answered only by the exigencies and mercies of fate and courage. So, today’s ancestor was a woeful day indeed; a day that saw the conception and inception of imminent birth pangs from the impending slave sale’s separation of mothers and children; and death pains as fathers were untimely severed from their progeny; lovers were torn apart by the most permanent heartbreaks, and siblings were divorced forever when the slave sale occurred. All these tragedies and their descendants were shrouded in the words of the slave sale advertisement, and ordained on paper with the certainty of ink; travesties that set in motion the rolling destinies of innumerable generations— people who would be scattered and battered over generations, but who would be gathered, fathered, mothered, ultimately emancipated, and whose posterity would be nurtured to see, yes, today. What havoc innocent words unleash at the hands of avaricious men, but what redemption and resilience there is in time, and love. What will the new dawn herald? What a day!